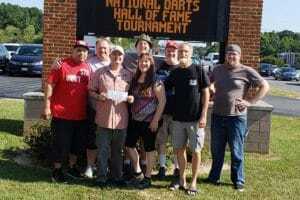 The objective of the Howard County Dart Association shall be to promote competitive darts and to coordinate dart functions and activities in and around Howard County, Maryland. We sanction league play according to the ADO rules of play and establish friendly relationships with other darts organizations, both local and National. 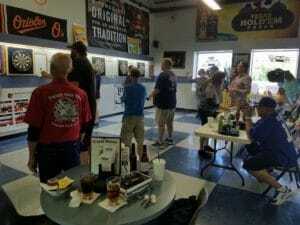 The Howard County Dart Association (HCDA) is a non-for-non-profit, non-political and non-sectarian organization. We welcome anyone who wants to participate in the game of darts in a sportsmanlike atmosphere and enjoys the friendships and social environment that come along with membership in our organization. We (HCDA) do charge an annual membership fee of $12.00 per player. This fee is due upon joining HCDA and is renewable each year at sign-ups for the upcoming fall season. The fee is for the purpose of our ADO sanctioning and ADO related awards and recognition. In addition, there is a $24.00 per person fee that is due at the beginning of each season. This fee is used for team and individual awards and our end of season parties. As a paid HCDA member, you are entitled to attend the end of season party, which generally will include food and beer/soda, luck of the draw and 50/50 raffle. At the end of the spring and summer seasons, we have outdoor barbecues that are family oriented and include the above activities. At the end of our fall season, we have our party at a public establishment. Family members and friends are also welcome to attend for a reasonable fee. Team captains are chosen by members of each team and are responsible for team conduct and sportsmanship, keeping up the pace of play and filing weekly score sheets with the scorekeeper and re-matches. The team captain is required to attend the captains meeting at the beginning of each season where they will receive the season packet containing rules, score sheets and other information pertaining to the upcoming season. HCDA matches are played on Wednesday nights, beginning at 7:30 pm. Players are expected to arrive on time for their match. Matches are usually concluded between 10:30 and 11:00 pm. Four (4) “Cork Call” singles matches, with a best 2 of 3 games scored. Four (4) “Cricket” singles matches with a best 2 of 3 games scored. Two (2) “501” doubles matches, each straight in, double out, best 2 of 3 games scored. Two (2) “Cricket” doubles matches, each best 2 of 3 games scored. One “701” single in, double out game, min. of 4 players from each team. The HCDA schedule generally includes home and away matches alternating as many times as the schedule allows. This is based on the number of teams in each division per season. If you are interested in HCDA, please come out and join us on any Wednesday evening to see what we are all about. Introduce yourself to any of our members and don’t hesitate to ask questions, join our email list and gather information on joining HCDA. For information on joining our HCDA family, please feel free to contact: Kendra Weikel (League Treasurer) at (301) 310-9764 or kweikel7@comcast.net for further assistance. Visit our website www.hcdadarts.com for events, updated information and league announcements. We also have links and information on league play, rules, dart equipment and links to other darts organizations in our area and around the country. We hope to hear from you soon!